As much as we try to be super careful about spelling and grammar when using our smart phones and tablets, we’re only human and are still bound to make mistakes. Which can be a little embarrasing. 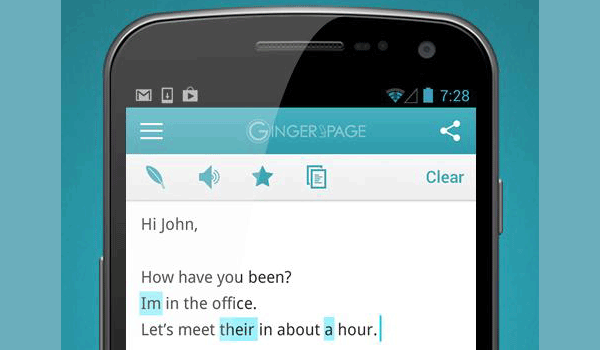 Luckily, if you value writing perfect English that much, there’s now an app which can help. Ginger Page is a free web tool which you can use to run a quick error check on your writing. There are also apps for Android and iOS, extending the service to mobile devices. There are two ways you can use Ginger — as your default keyboard or as a separate app where you can type in your entry while it checks for errors, after which you can then copy and paste it somewhere else. Either way, it’s a great tool for real-time error checks, as incorrect spelling and grammar is highlighted in real time as you finish typing each word. The suggested corrections appear on the top part of the keyboard, and you can choose to ignore or accept them as you go. In addition to the usual spelling and grammar checks, you can also choose to translate or define a highlighted word. One important requirement of the app is an Internet connection, otherwise the service won’t work.